Age: 3+ Be anything with Barbie career dolls! 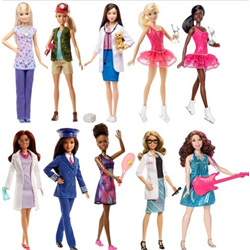 Each Barbie doll wears a professional outfit with signature style. An iconic accessory expand the storytelling fun. Collect them all variety includes: Pilot, Ice Skater, Nurse, Vet, firefighter, and chef.